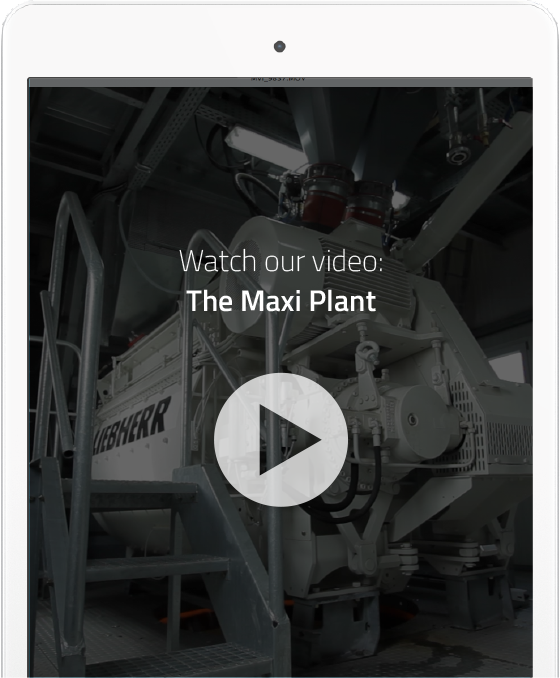 After evaluating all the concrete plant manufacturing technologies around the world we decided to invest in a state­ of the art Liebherr German plant due to their vast expertise. The concrete plant which was built and installed in the summer of 2014 is a Betomix 2.66m3 twin shaft wet batch plant capable of producing 110m3 per hour of compacted concrete with silo capacity of 400 tonne and aggregate capacity of 650 tonne. Thus making Maxi Readymix’ concrete plant the most technically advanced concrete production facility in Leicester and the East Midlands. Our plant is equipped with state-­of-­the-art microwave moisture sensors to closely monitor water content in the sand and gravels to ensure the accurate level of water addition required. This goes above and beyond the level of any traditional concrete plant and has installed additional slump monitoring devices inside the mixer to ensure the desired slump / flow and workability are achieved for the specification required before releasing the concrete into the mixer vehicle. Such is the capability of our concrete plant that our fleet of mixers are only required to agitate the concrete to the project. Therefore, should customers wish to collect their concrete directly from the plant this can be achieved with ease and speed.